Blog "I want my bridesmaids to all have a different flower...."
This is a design idea that we work with occasionally at Sisters. It is a definite possibility for brides who are flexible about shades of colors and flowers. A word to the wise: if you have lots of maids (more than 5) or if your color is not a common color for flowers (blue, green, “a certain shade of pink”, etc.) this may not be the style for you. Sisters Flowers can make flower suggestions based on your color palatte. 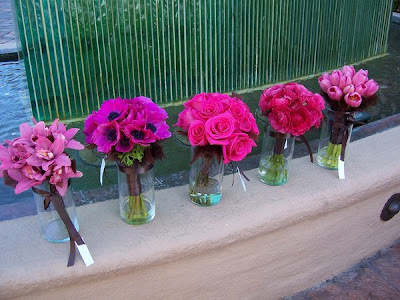 Here is a photo we found on-line that demonstrates what a different type of flower for each bridesmaid looks like. This particular design used all bright pink, but notice that even the shades of pink vary from flower to flower. Another thing to note about this particular style is that the shape and size of each bouquet will inevitably be different from one another. Some brides really like this style and difference in textures and even use all of the maids’ flowers mixed together to make up their bridal bouquet. If you like texture and uniformity is not your ultimate goal, this is certainly a unique way to set your wedding style apart.